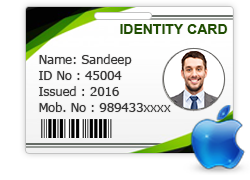 ID card maker creates Employee id badges, Student ID card, Visitor ID card using various pre-defined ID Card Design (pre-loaded templates) on Mac machine. Software facilitates you to design multiple ID Cards with different barcode value and text. 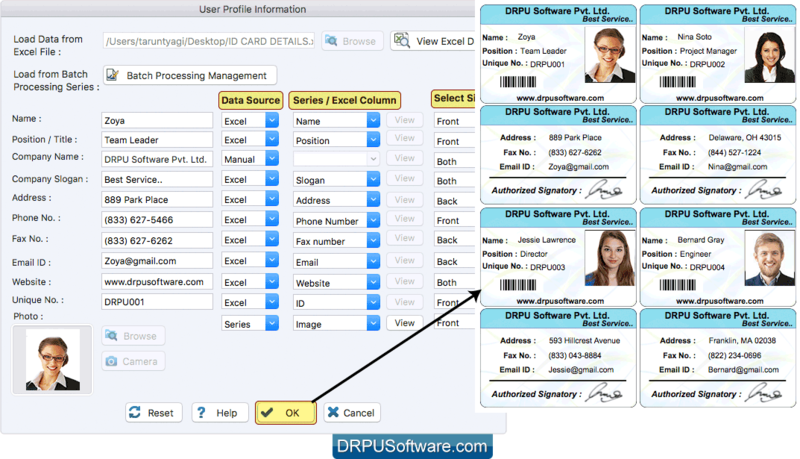 DRPU ID Card Designer for Mac provides facility for Mac users to design customized ID cards or badges by browsing ID card details from excel file. Now you can design professional looking ID cards using various shapes, colors and sizes as per your requirements. Mac users can also print multiple identification cards simultaneously using flexible print settings of DRPU ID Card Designer. Design Multiple ID cards with different barcode value and text using 'Batch Processing Series'. Batch Processing Series feature allows you to generate multiple ID cards with different barcode and text value. Software provides advance print setting feature to print created ID cards with support to all major types of printers. You can easily import excel file data to generate multiple identity cards. Save designed ID card log on your Mac machine for future reference. Software provides facility to send designed ID card to the single or multiple e-mail addresses. Option to add image from the library during ID designing process. Design and create Identity cards using image designing tools including Line, Ellipse, Rectangle, Text, Barcode, Picture, Triangle and Star objects. Software is having option to start new ID card format or edit existing ID card format.